Shipwrecks are plentiful in Haiti, and that was something my dad Greg Brooks was finding out more and more in the early 90s. Beneath the Porcelain Wreck were two other shipwrecks, each buried deeper than the last. This underwater puzzle had truly been forgotten by time, and as the years passed each wreck had been buried by dirt and sand and yet another shipwreck. Each stacked shipwreck had its own story and artifacts, but laws were still strict in Haiti at this time and there was no way my dad could take any of these objects home with him. Besides the few small pieces from the Porcelain Wreck that my dad was permitted to hang onto, the rest of the items recovered were taken by Jean-Claude Ditmar to be put on display in a Haitian museum. 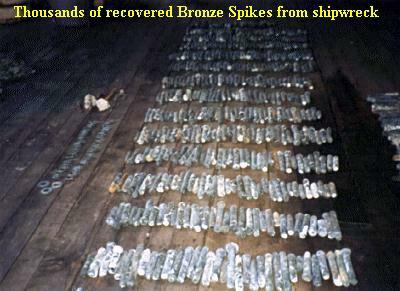 One artifact of interest from the Porcelain Wreck was the great number of bronze spikes the crew was able to pull up. These spikes (shown in picture) were used to build the French ship that had been holding all of the porcelain items, and many were still attached to pieces of wood, though most had come loose as pieces of wood eroded underwater. It’s one thing to read about wooden ships of old, but to actually see pieces of them and the nails that held them together is another thing entirely! After a couple of medical incidents (which I will detail in my next story) the crew of Silver Bars had to return home. They weren’t ready to give up yet, and returned to Haiti later in 1995, this time venturing to the South Coast near the town of Les Cayes. One of the shipwrecks they were trying to recover here was the HMS Southsea Castle, a British ship that had been escorting a Jamaican ship with a lieutenant commander onboard. They were able to locate some of the treasure onboard, which included some swords, bottles, coins, emeralds and rubies, and a particularly interesting jewel-encrusted sword embedded in coral. Government issues prevented the crew from recovering any of it, and so it still lies there to this day. While the team was having lots of luck locating the shipwrecks, they were realizing just how difficult it was to contend with the governments and the strict laws protecting the underwater cargo. In Haiti, it was near impossible, and money was running out for my dad and his crew. He was going to have to come up with another solution.